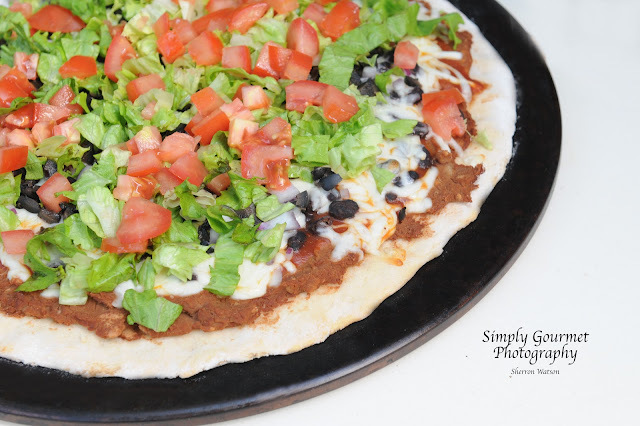 The year must have been 1983 when I first had taco pizza. I lived in a small town as a teenager named Molalla. We were known as the Molalla Indians at my high school. It was a logging town. 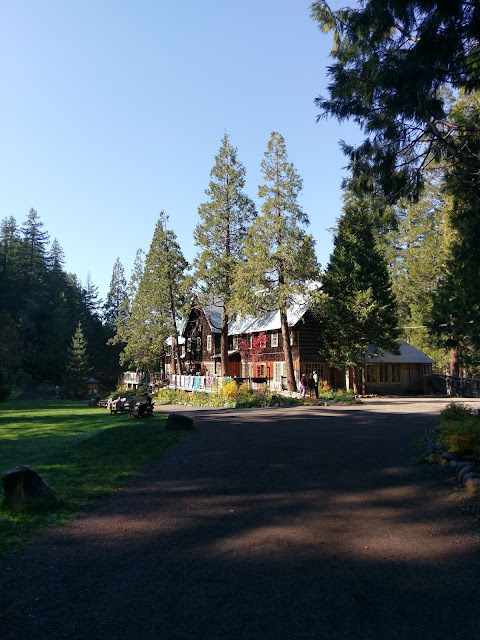 Early in the morning you could hear the rumble of the large log trucks, see the steam from the mills and smell the scent of fresh cut pine in the air. I would visit my aunt in the summers before we moved there ourselves. I would spend numerous days riding my bike on the logging roads. Yep, they had their own roads. The trucks did a lot of damage to the highway roads plus it kept them from driving through town. We had one blinking light. There wasn't a McDonalds, grocery store chains or new subdivisions. Our population was about 2500. It was great. Our place to hang out was one of the largest gathering places in town, besides the local churches. Michaello's was the place to be after football games, after dates to enjoy the ice cream bar or to just hang out with your friends. Their pizza's were nothing fancy but you could get a huge one for a good price. They sold pop by the pitcher and for a teenager in the 80's that was a good thing. Of course this has all changed. The population is around 7500, Safeway and McDonalds are both in town, they have a real stop light and the property is being sold to create more housing. I made one and we had a few slices left over. I made the crust a little bit different this time. I used some masa harina in the dough. I was a bit leary of trying something new. 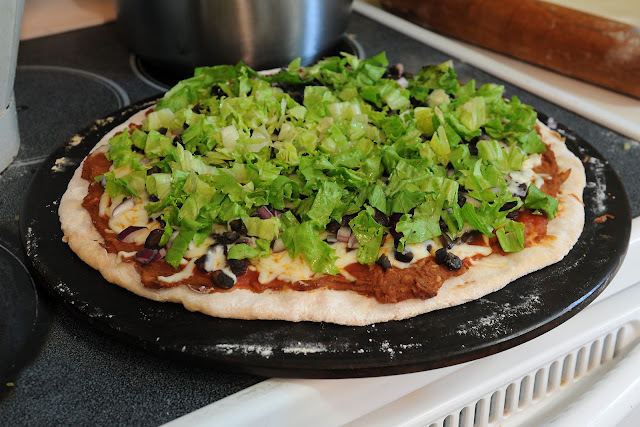 It worked and the corn flavored flour added a lot of flavor to our taco pizza. The recipe makes enough for two crust. I used one and put the other in the fridge. The next day I took it out, wrapped it around a few hotdogs, let it rise and baked for a few minutes at 425. The dough has a cool feel to it. It's doughy like pizza dough and can be rolled very easily but it also has the feel of homemade corn tortilla dough. It breaks off easily and kind of grainy looking. It reminded me of homemade playdough. As with most pizza, you can use all types of toppings to make it your own. I will share with you what I did. 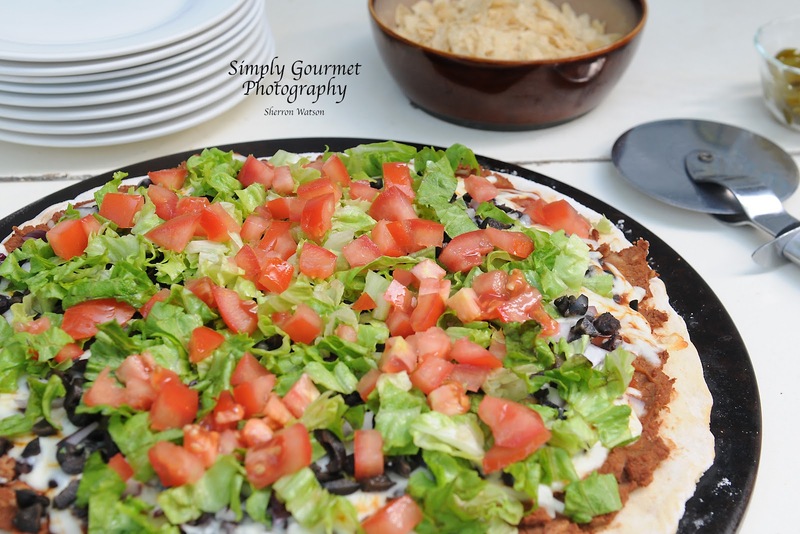 It reminds me of a 7 layer taco dip but on a crust and with mozzarella cheese. Proof your yeast by adding the yeast and sugar to your warm water. Wait about 5 minutes for the foam to appear on the top of your water. If this does not happen, your yeast may not be good or your water is too hot. Start over. In your kitchenaid with the dough hook, add the flours, salt, cumin, and proofed yeast. Have a small amount of flour near by in case you need to add a bit more to the dough. Set your kitchenaid to a medium speed and knead your dough for 8 minutes. You want the dough to look like bread dough. If it is not pulling together into a ball add a bit more flour or water until this is reached. You will need the dough to be worked for the full 8 minutes. 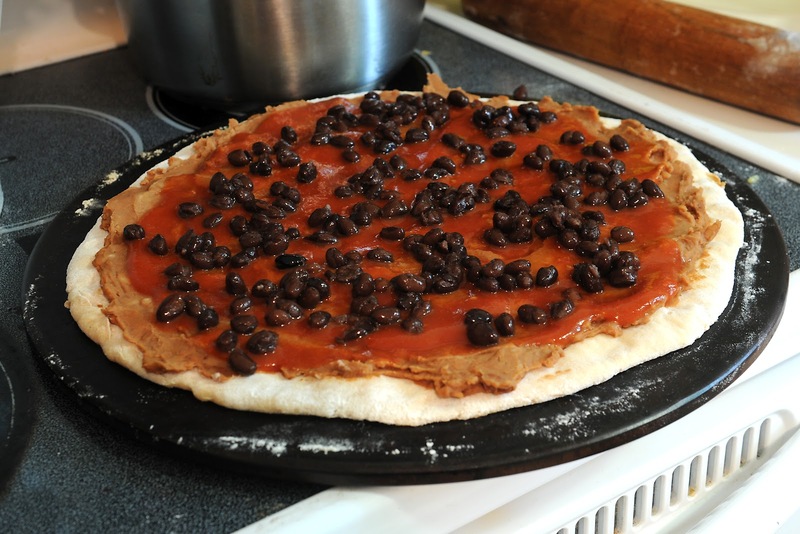 In an oiled glass bowl, add your dough and let double. Cover with plastic wrap. Mine took an hour and a half. Preheat your oven to 425. If using a stone, let the stone heat up with your oven. 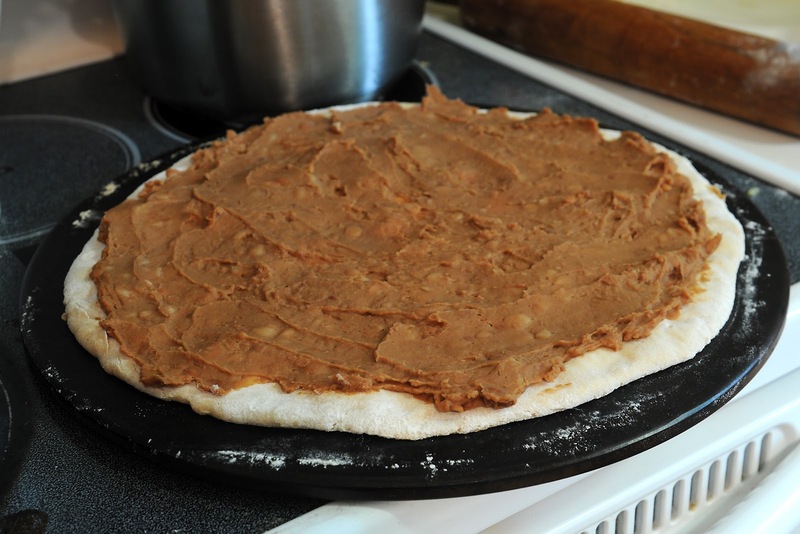 Roll your dough out on a floured surface until your desired size it reached. Bake the dough for about 10 minutes. 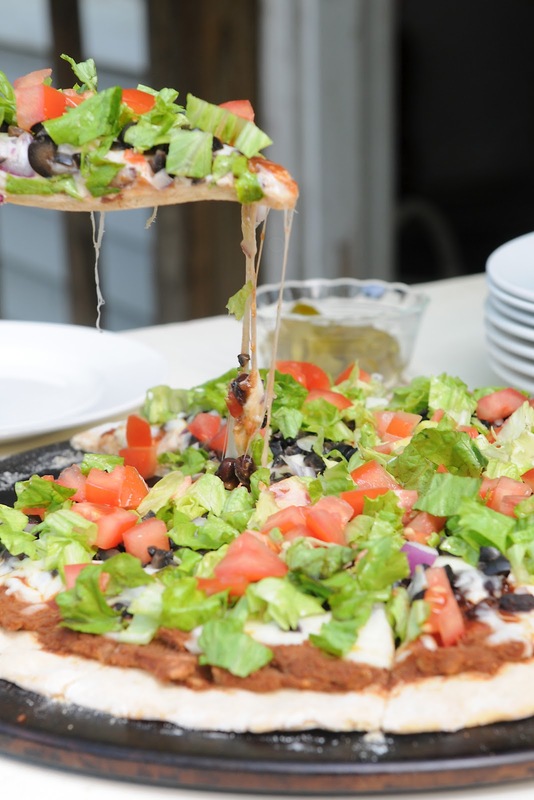 Remove and add your toppings. 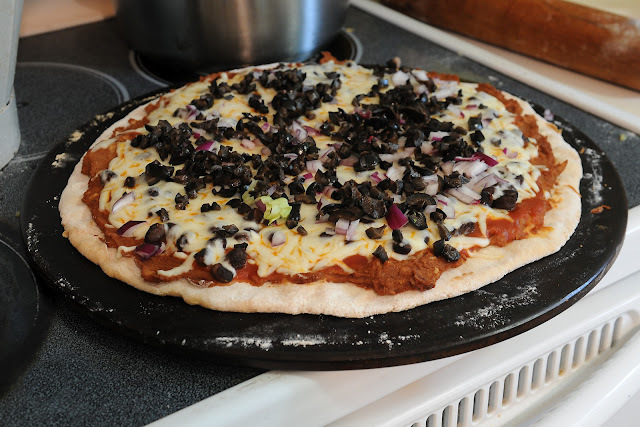 Start layering your baked crust with your toppings. I will show you with pictures the layers that I did. 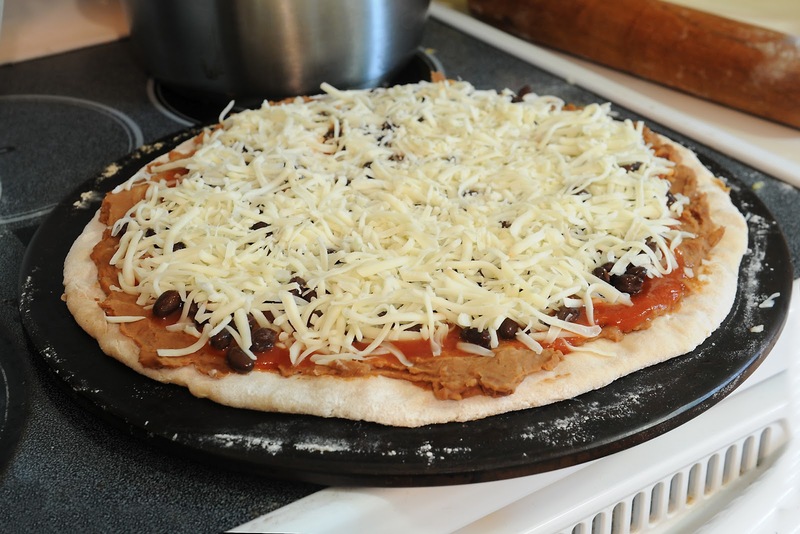 You will need to bake your pizza again after you add the cheese layer. Read below. Heat your refried beans up first. This makes it a lot easier to spread them onto your pizza. 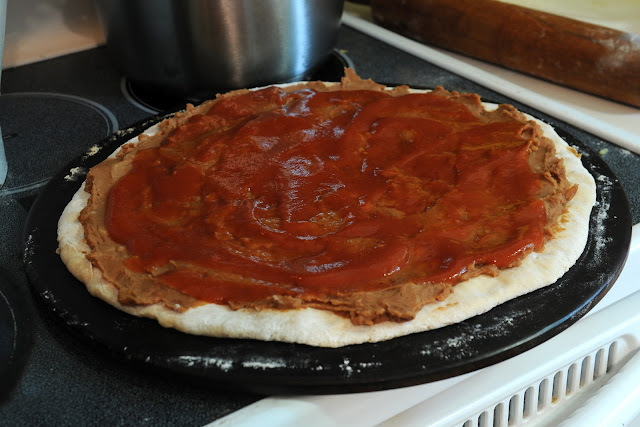 I put the refried beans first so that the sauce would not all be soaked up by the crust. This is one of my favorite parts of the pizza. You don't have to add black beans but I already had an open can so I used them. You can use a different type of cheese, but beware that cheddar is very greasy. 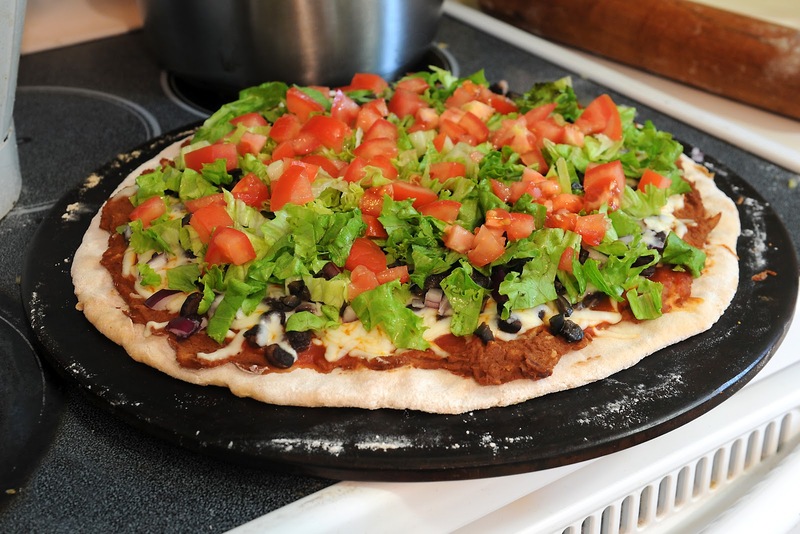 Mozzarella is a nice cheese to use even with a taco pizza. At this point you want to bake your pizza for 10-12 minutes or until the cheese is melted. Remove from oven and add your fresh ingredients. I served the other ingredients on the side. Looks fantastic! I love taco pizza but haven't had it in years! Great post! Thank you and I hope it inspires you to have it again soon! Nice read. 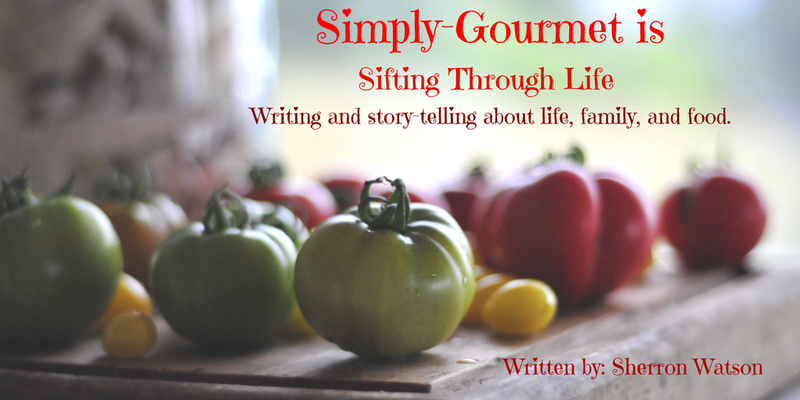 Well written, and the recipe looks great. This is AWESOME!! 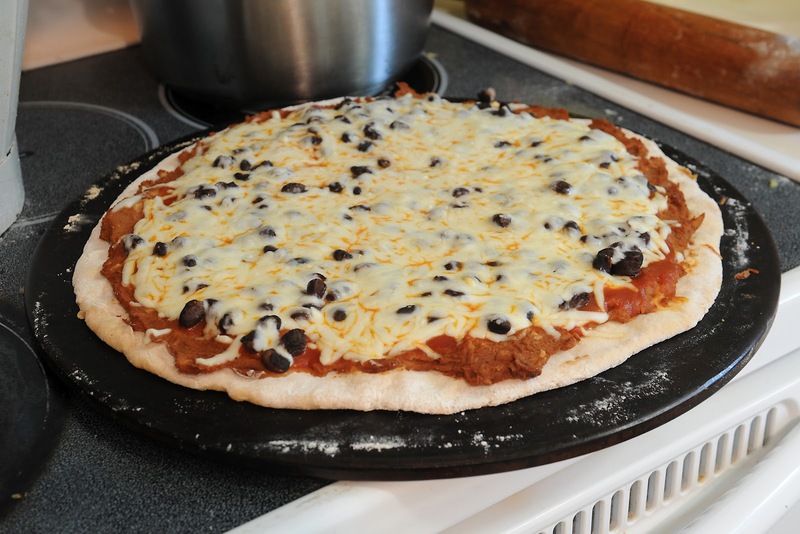 But, I like to bake one pie with jalapenos and one pie without; for the faint at heart. If you never had a pizza baked with jalapenos, you are definately missing out. You can use the mild, jared jalapenos if the fresh ones carry to much heat for you. If you are using fresh jalapenos, be sure to core out the seeds and membranes for that is were most of the heat of jalapenos are held. Just be sure to gently pat the jared jalapenos dry with paper towels before adding them. YUMMY! LOL! That sounds wonderful and I will do that next time around! Thanks for the recommendation.